Castell’Arquato is a picturesque medieval hill town in northern Italy’s Emilia Romagna region. A castle and Romanesque church sit at the top of the hill with the village cascading down the hill below them. 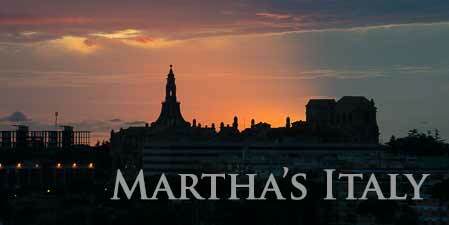 From the small park near the castle you’ll have great views of the surrounding countryside. Castell’Arquato is in western Emilia Romagna, between Parma and Piacenza. See its location on our Emilia Romagna map. 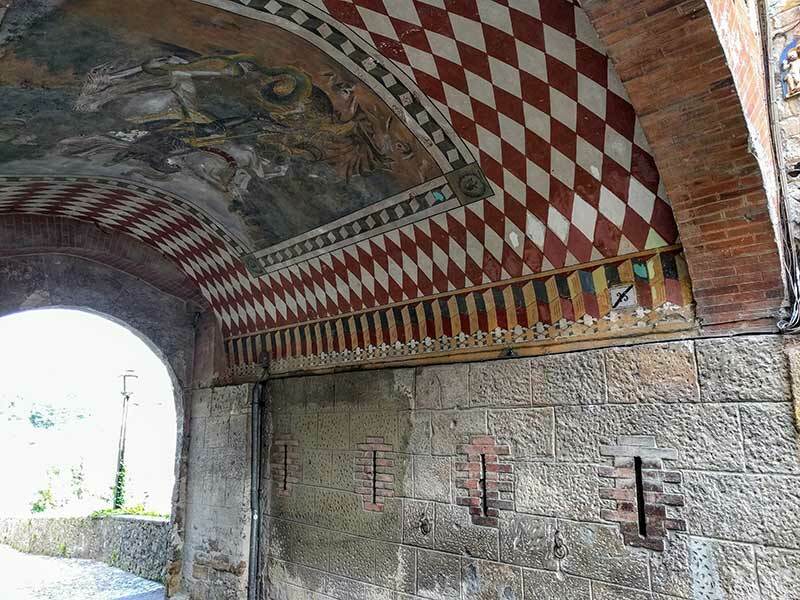 It’s part of the Castles of Parma and Piacenza circuit, an area with several interesting castles that you can visit. Several free parking lots are at the lower entrances to the town. Traffic is restricted in the historic center so you can’t drive up the hill but compared to some hill towns in Tuscany and Umbria, this hill is a pretty easy to climb. If you want to spend the night, Albergo Leon D’Oro is a 3-star hotel right at the foot of town by parking lot 2. Or stay in one of the bed and breakfast inns in the center, Dimore del Podesta or B&B del Ducato. Several restaurants serve the renowned cuisine of the Emilia Romagna region. We had a good lunch at Osteria del Borgo, part way up the hill. There’s a wine bar near the castle. 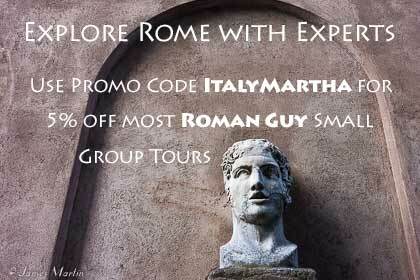 Walk up Via Dante, a charming street that leads to the monumental part of town. Along the way you’ll pass a few shops, restaurants and historic buildings. About halfway up is a 16th century tower and the Palazzo del Duca, dating from the 13th-14th centuries. The fountain by the Palazzo was built in 1292. Just off the square is the 12th century Romanesque Collegiate Church of Santa Maria Assunta. Inside are 12th century carved capitals and sculptures and beautiful 15th century frescoes. Next to the church is the Museum of the Collegiate Church, entered through a pretty cloister. Rocca Viscontea di Castell’Arquato, the castle, is the masterpiece. Visit the courtyard, fortress museum, and climb the tower for a single ticket or buy a combination ticket that includes other museums. 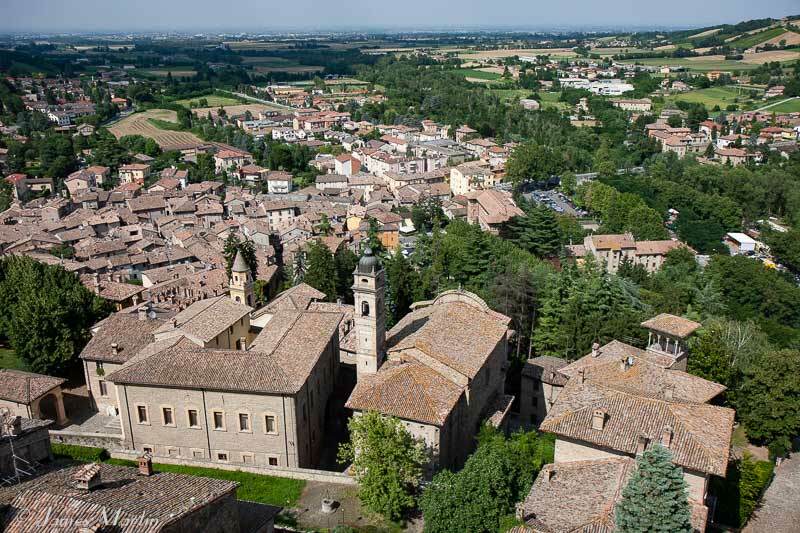 From the top of the tower, you’ll be rewarded with a fantastic view of Castell’Arquato and the beautiful countryside. From mid-March to mid-October, the fortress is usually open daily, but the rest of the year only on Saturdays and holidays. A pretty park next to the castle is a good spot to rest and enjoy the scenery. Public restrooms are just below the park. If you’re traveling with kids, there’s a children’s play area in the park at the lower part of town. Fortress Museum, in the castle, has a video about the castle and four rooms about life in the middle ages, plus the castle tower. Museum of the Collegiate Church, in the cloister next to the church, includes marble pieces and sculptures as well as a visit to the cloister. G. Cortesi Geological Museum has local geological collections and information about the fascinating geology of the region. It’s inside the former 16th century Ospitale S. Spirito. Luigi Illica Museum is a museum of opera and prose with a collection of opera scores, costumes, manuscripts and letters. Castell’Arquato is one of the 25 castles in the Castelli del Ducato di Parma, Piacenza, and Pontremoli, some of the best preserved castles in Italy. 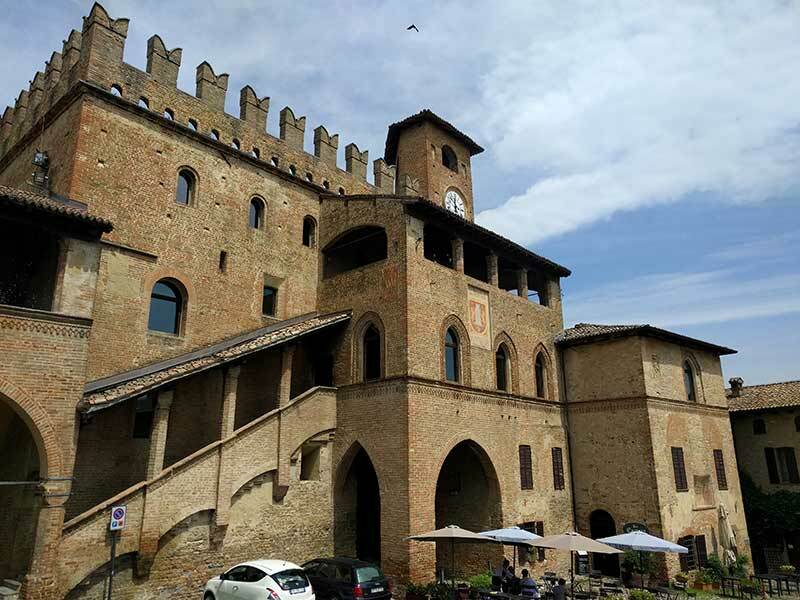 At the castle you can buy a discount ticket that saves you money at all 20 castles, including Castell’Arquato. Vigoleno Castle is another great castle to visit, about ten kilometers away. 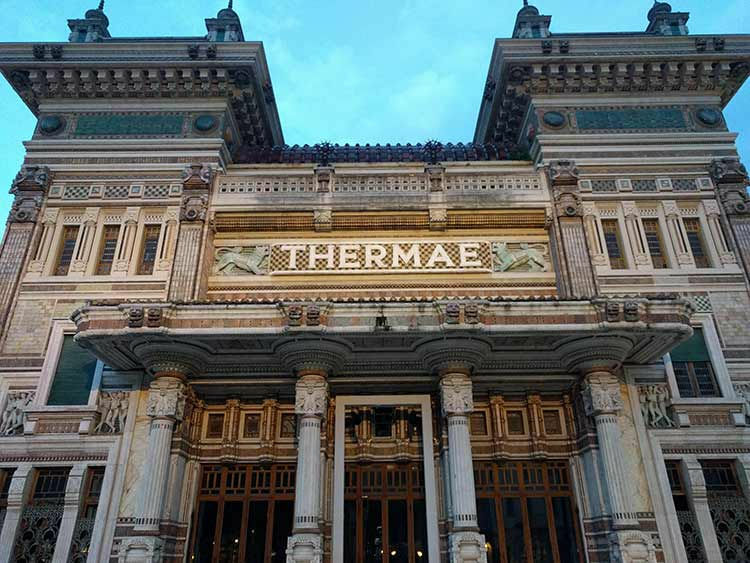 The thermal spa town of Salsomaggiore Terme, about 20 kilometers away, has art deco architecture, a pedestrian zone, and parks. The town makes a relaxing base for visiting the area.